Just wanted to share a few photos from our nature walks this weekend. Winter hasn’t released its grip on us entirely yet, but things are getting better. And a bit of fresh air and exercise always helps improve my mood, giving me a boost of endorphins in my winter-addled brain. 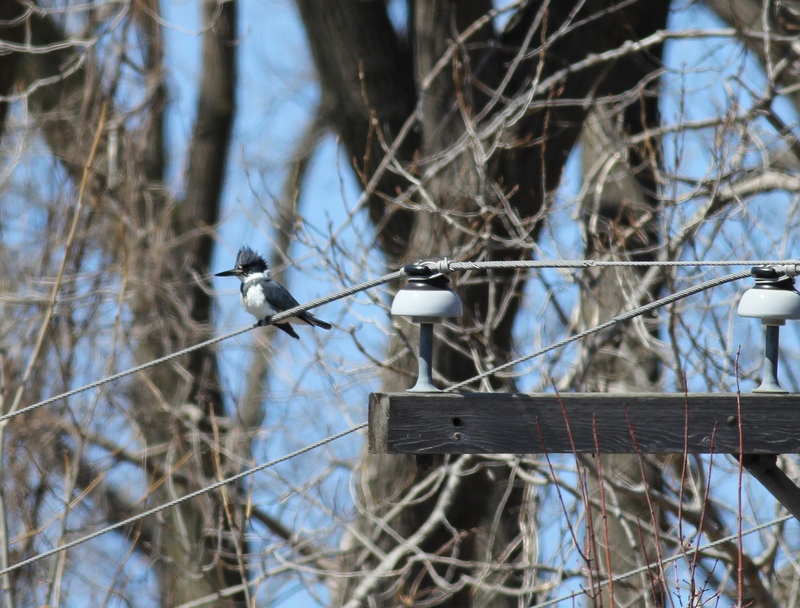 We saw some ducks on the pond and watched a male Belted Kingfisher flying from perch to perch, watching for a chance to swoop down and grab a meal. Four species of ducks here, coexisting peacefully (at least at the moment). Kingfishers are Eric’s favorite bird, so it’s always fun to find one of them. 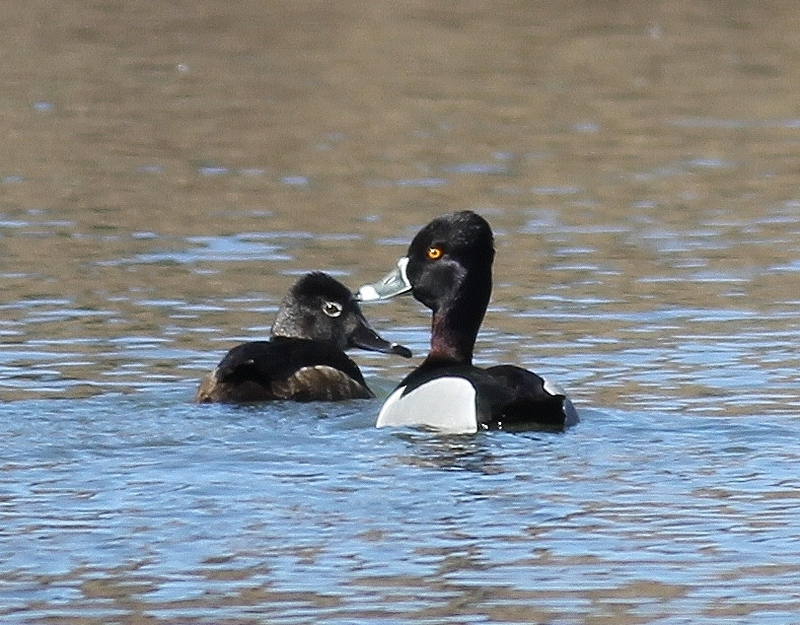 Male and female Ring-necked Ducks, just chillin’ in the pond. We walked along the river banks, enjoying the now free-flowing water. This part of the river is very curvy, so the current is fast. 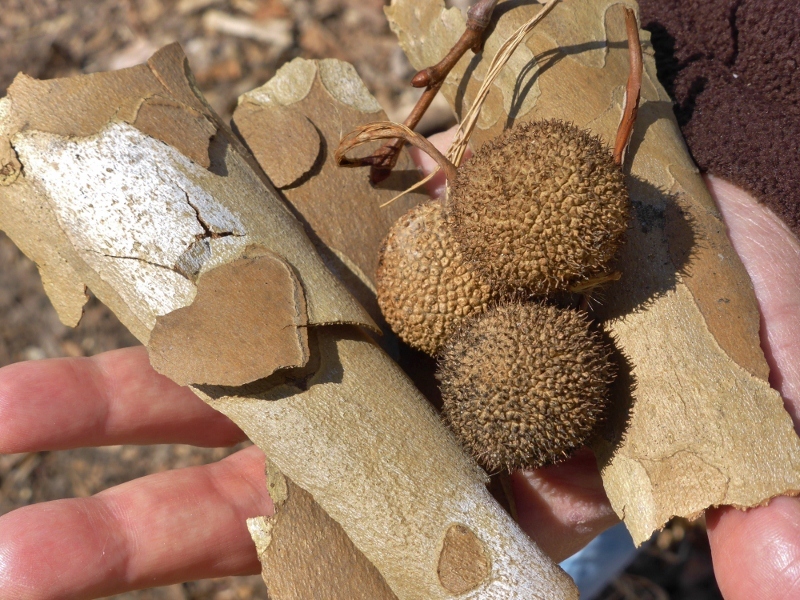 There are beautiful sycamore trees here, displaying their mottled gray and brown bark and their pointy seed pods. Sycamore bark and seed pods. I loved the heart shaped section of bark. 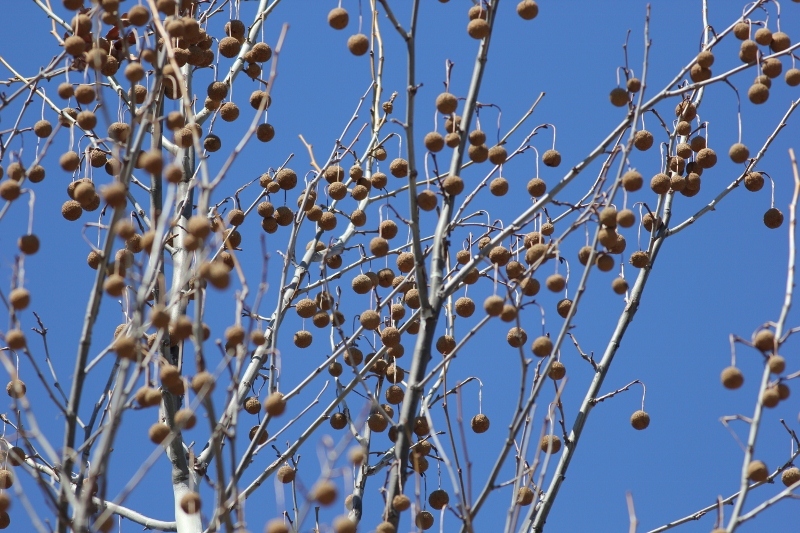 Sycamore seed pods decorating the tree. Those ducks are too far away for a good shot! 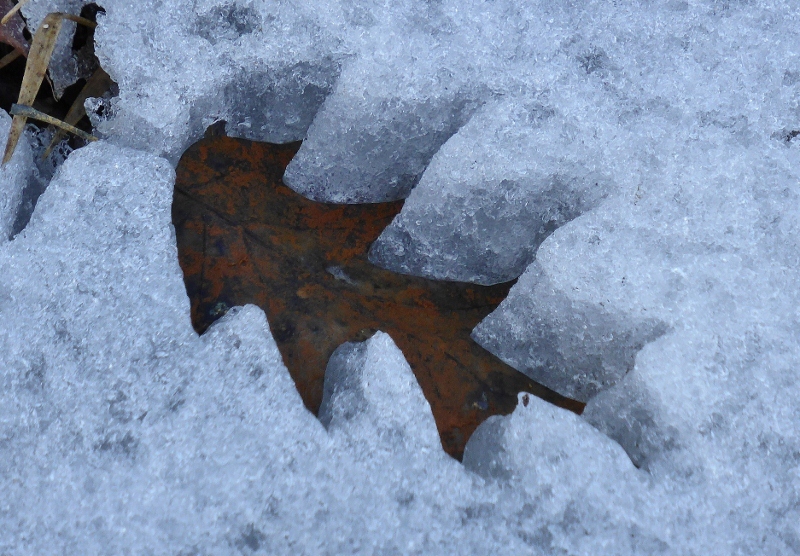 I almost walked right past these leaf cookie cutouts in the snow — aren’t they interesting? 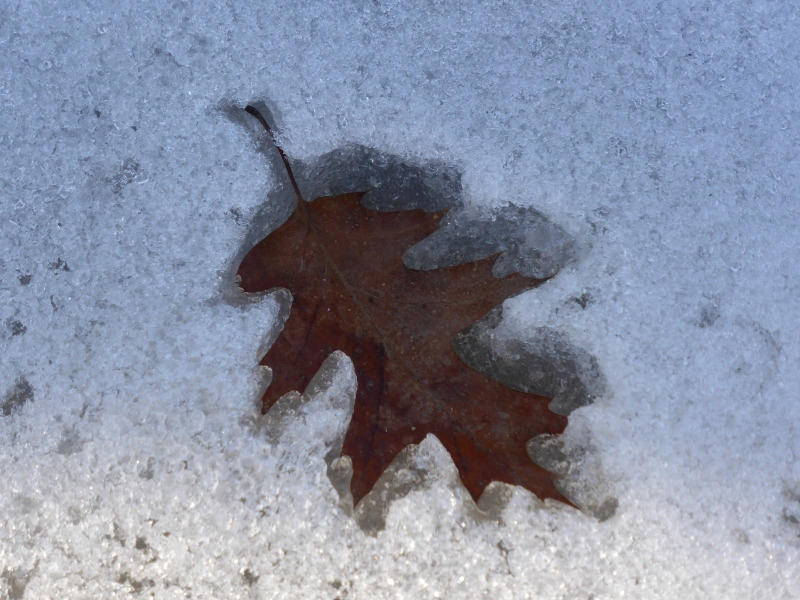 I’m guessing that the dark color of the leaves absorbs more of the sun’s heat, melting the snow below the leaf faster and letting it sink down. I’m trying to remember to take wider landscape shots occasionally instead of always zooming in really close, so here are some views of the scenery. 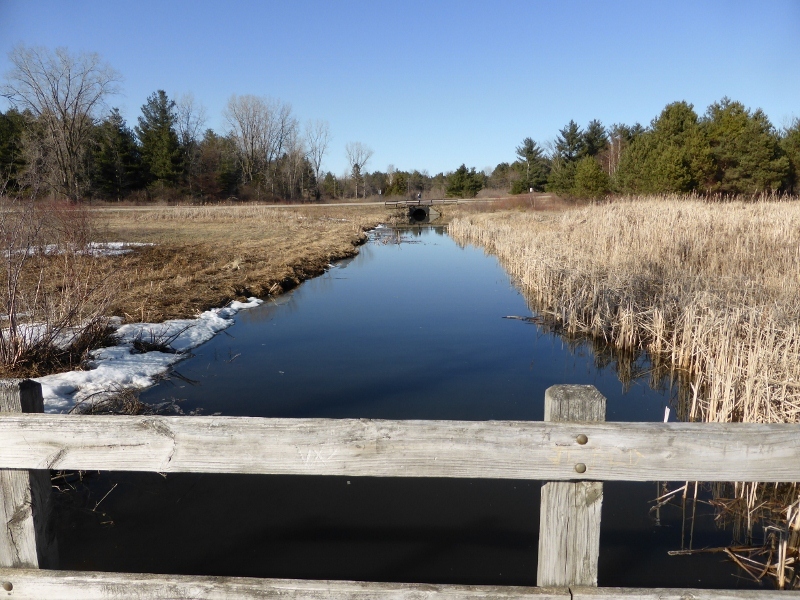 Clinton River — no more ice!! Can you see the guy fishing and his black dog on the bank? Stony Creek lake, still about 75% ice-covered. Back at home I went into the woods to see if there were any signs of growth under the snow. I found 2″ shoots of daffodils and 3″ skunk cabbages. And then I found this half of a seed pod or maybe a nut shell — I have no idea what it is. Can anyone help me with an ID on this? What is this? It’s about an inch and a half long (this is a front and back view of the same half shell). 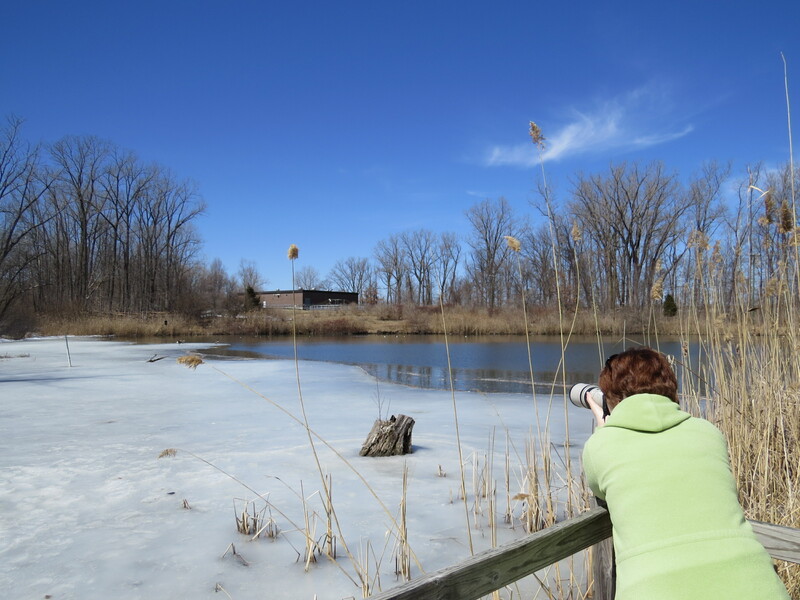 This entry was posted in Ecotherapy, Walking in the Woods and tagged birds, Michigan, nature, winter. Bookmark the permalink. Kim I love those leaf cookie cut out, so beautiful, I find the colder months have so much to offer when it comes to photos. Your photo’s are gorgeous and I breathed in the fresh air and smiled. Thanks for the kind comment, I’m glad you enjoyed your time here! Kim anything to do with nature and I am there…..
Beautiful photos, Kim! 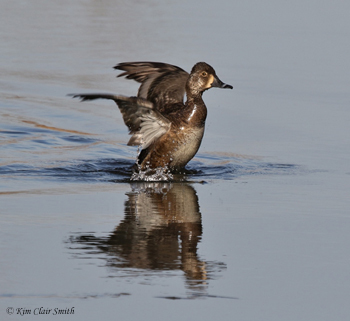 It’s hard to pick one favorite, so I’ll choose three: the Kingfisher, the sycamore pods, and the Ring-necked ducks. Thanks for finding and sharing all of these lovely sights. Judy, it’s my pleasure to share what I’ve seen on my walks — I’m glad you enjoyed these! Nice post Kim! 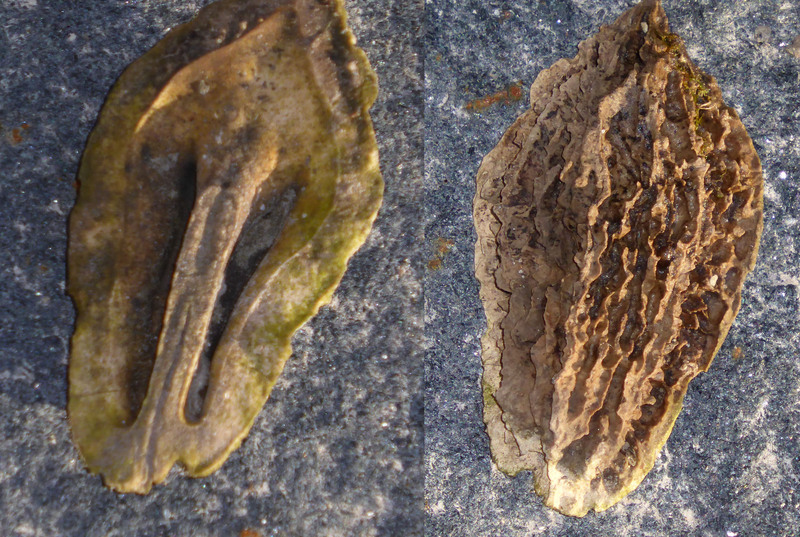 Sometimes it’s just the ordinary that can be fascinating – like the cookie cutter leaves and the sycamore seed pods. It’s wonderful to see the ice yielding and the open waters rippling with life again. Our winter was harsh in Oklahoma, but I can’t complain when I realize what you Northerners have had to tolerate. It won’t be long and you’ll be seeing “green” again!! I just realized while reading your comment that my beloved peonies are still buried under 3 feet of snow that we raked off the roof. I’d better get out and try to chip away at that pile so those early bloomers can get started on time! I’m glad you are finally seeing some signs of spring! I love the leaf cookie cutters. I’ve never seen anything like that before. I think this is the first time I’ve ever noticed that too, Kristie. Glad I was looking down instead of up for a change!